In Traditional Chinese Medicine (TCM), stress, anxiety, and depression are manifestations of disharmony in the organ systems. That "stuck" feeling, for example, is a result of prolonged stagnation of the Liver. Don't panic! This doesn't mean something is actually wrong with your liver - it's our way of differentiating patterns in TCM theory. Throughout the course of your treatments, you can expect to feel calmer, sleep better, think more clearly, maintain a healthier blood pressure, improve your digestion, and more. Click on each topic for details or scroll down! Let's be honest: nobody enjoys dieting, especially in a city with so much food diversity. Acupuncture and Traditional Chinese Medicine (TCM) food theory can help you reach your fitness goals, whether you're training for a sports event, trying to lose weight, or just trying to stay active. There's no strict diet you need to follow, no uncomfortable waist band to wear, no strenuous exercise – just 20-40 minutes of relaxation. Binge eating: due to stress, anxiety, insatiable appetite. "Heavy feeling": when you drag yourself to the gym, when your legs feel heavy just walking. Metabolism: improve your digestion and improve the way your body uses the food you eat for energy rather than fat storage. Whether you've been in an accident, suffered from a sports injury, or feeling the strains of too many hours at the desk, acupuncture can help you. In Chinese Medicine, pain is due to stagnation of Qi and Blood. Under normal circumstances, your body will naturally free this stagnation and recover on its own. However, complications can hinder your body's natural healing process. By inserting fine needles into strategic points on the body, acupuncture can free the stagnation and promote healing. In 2011, a reckless driver crashed his car into me and my bike. Thankfully, I only suffered minor injuries with various abrasions and sprains. After just two and a half weeks of regular acupuncture and herbs, I was still able to participate in Warrior Dash and successfully finish! No Side Effects: Unlike most medications, acupuncture has little or no side effects. Common side effects of common pain medications include upset stomach, constipation, dry mouth, and blurry vision. Overdose can be fatal, and more serious side effects can occur if you have other health complications (you may read about Vicodin by clicking here). You're already dealing with a lot of pain, so why suffer through other health complications as a result of side effects from medications? Get Off of Pain Meds: Keeping track of taking various medications can be stressful, and being dependent on pain medication is no fun. Acupuncture can help alleviate pain, support recovery, and help you decrease dependence on pain meds. Long Term Healing: Don't just mask the symptoms! Acupuncture and herbal medicine can help you truly heal. Alleviate the pain and recover faster. Unlike pain medication, you get long-term effects: health and happiness. Surgical Recovery: If you're recovering from a surgical procedure, acupuncture can help you recover faster, get back on your feet, and back to your life. Cost Effective: By addressing the problem now, you won't put it off until later, when surgery may be necessary. You won't need to take time off work to get an acupuncture treatment, whereas you'll need a few days to recover from a surgery. Increase ROM: One of the major complications of injury is the scar tissue, which reduces your range of movement (ROM) from before your accident. By opening channels and meridians, acupuncture can relax the muscles, free stagnation, and promote ease of movement. More and more athletes are recognizing the benefits of acupuncture. Italy's Vicenzo Nibali, winner of the 2014 Tour de France, claimed that acupuncture was one of his secrets to victory. Many NFL players, like New York Jets fullback Tony Richardson, are seeking acupuncture treatments to enhance their performance as well. Whether you're training for a marathon, obstacle race, or just want to get in better shape, we can help! Treatments for hair loss usually involve acupuncture for systemic balance, herbal hair mask with Plum Blossom stimulation, nutritional counseling, and herbal prescriptions. Under normal circumstances, patients typically see results after 3-4 weeks. Chances are, you're one of the 70% of American smokers who have tried to quit smoking at some point in their lives, and you know how hard smoking cessation is to achieve. You don't have to do this alone. "Acupuncture is successful with smoking cessation and has turned a growing number of cigarette smokers into permanent ex-smokers," says Diane Joswick, L.Ac. In a study conducted at the University of Oslo, Norway, acupuncture was found to significantly reduce the desire to smoke up to five years after the initial treatment. Subjects of the study also reported that cigarettes and tobacco tasted worse than before treatments. The most common withdrawal effects of quitting smoking that people complain about include jitters, cravings, irritability, and restlessness. 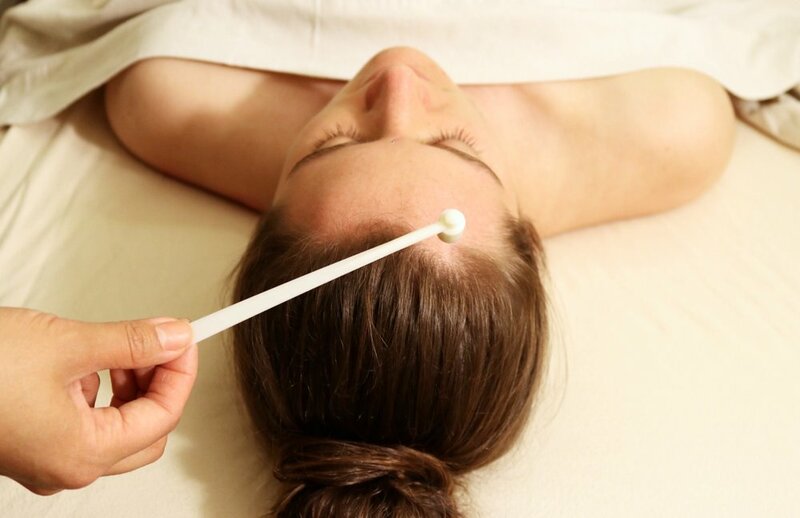 Acupuncture treatments take a holistic approach, meaning it takes all of your symptoms into account, and treats the root of the issues to bring your body back into balance. You can find more resources on smoking cessation on NYC Quit's website: www.nysmokefree.com. Also check out the social network for people quitting smoking: Quitza.